This very typical beginning is how we started the process for the “I Voted Today” project. We’re a designer and a developer who have been collaborating on website projects for about two years. Six months back, we decided to make things more official when it came to the projects we like doing the most — small Web design projects for important causes. We went through the process of branding this new endeavor we called Action Backed, complete with logo, website and social media presence. We formalized our process for bringing ideas into the world and started to solidify our beliefs in terms of design, the Web and cause-focused campaigns. Then we were ready to start telling people about what we were up to and why they should care. 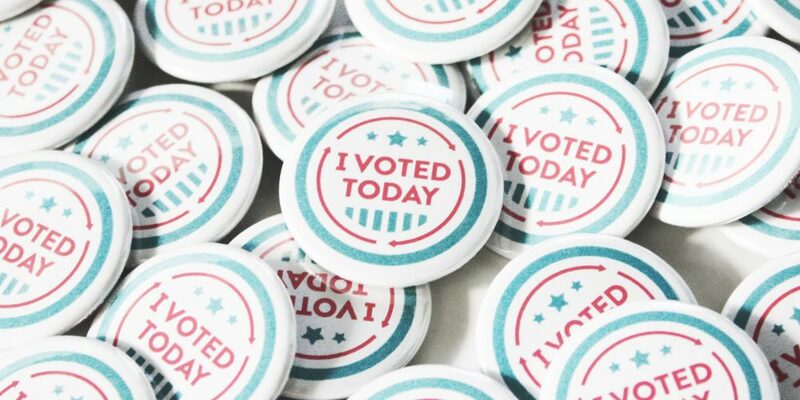 Official “I Voted Today” project button. We briefly discussed making some merch with our logo on a variety of items — T-shirts, stickers, buttons, etc. You know, the kind of stuff designers get all googly eyed over. We’d then package those items up, send them to potential clients and also make them available in our online store. But then we asked ourselves the question, “why just self-promote?” Why not put that time, energy and money into something more interesting? 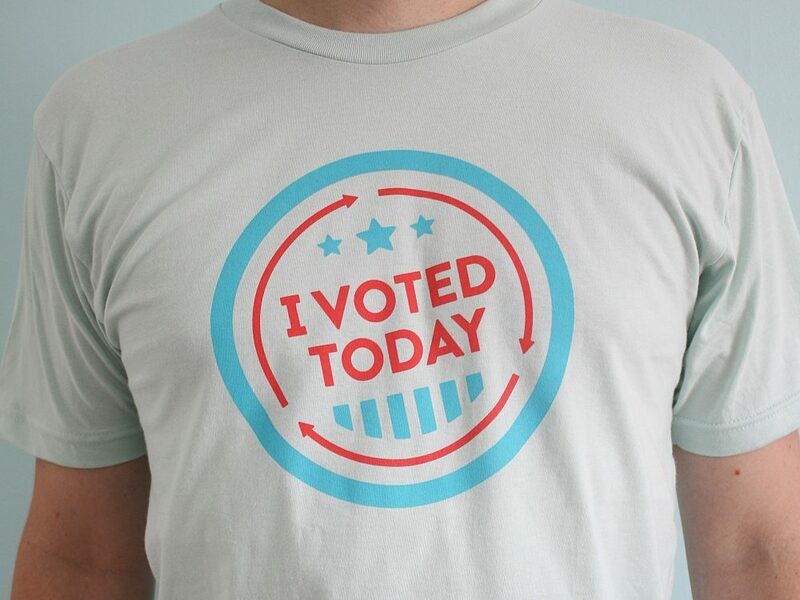 We did a very basic Web project in 2012 around that prized piece of democracy swag — the “I Voted Today” sticker. Visitors came to the website and could embed a widget of the sticker on their own sites and download some share graphics. That was it. This being 2014, the year of midterm elections in America, why not blow out that idea to get people really excited about voting in a year most people are not really excited about voting? 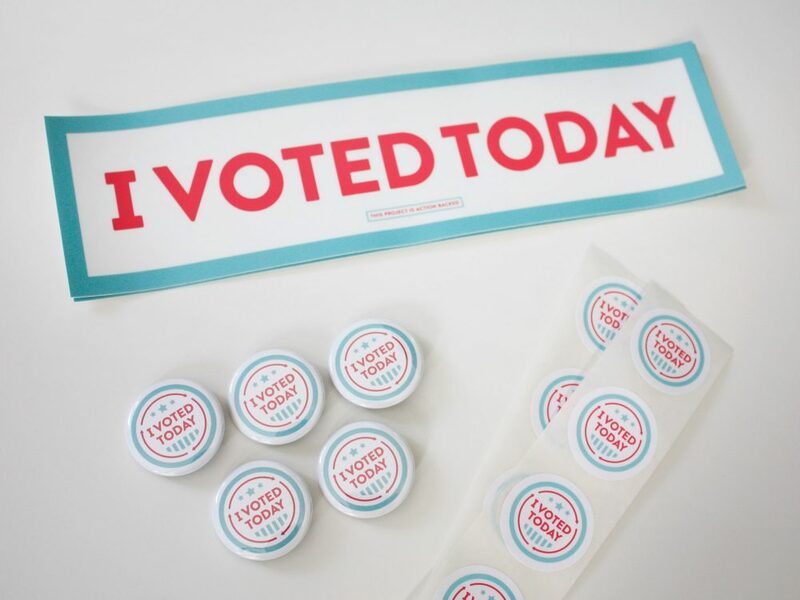 So we took that “I Voted Today” idea and backed it with our approach to design, development and storytelling for the greater good of American democracy. We knew it was going to take a lot of our time, some of our money and be in our mindspace for about seven months. But we think voting is really important and is a cause we loudly get behind. We also knew we wanted to collaborate with fine folks so we brought in two of our favorite people. They’re an animator and a creative strategist duo called Uphill Downhill. With them on board we were then a team of four. Initial sketches from Uphill Downhill. We loved getting these. We broke down the project in terms of responsibilities and deliverables. We crafted a project philosophy of how we like to work; independently, every cog in the machine fulfilling his or her area of expertise. Within four phases, we outlined 1) concept and brand design 2) animation 3) site design and development and 4) merch. We determined who was responsible for what and loosely when things would be due. With this basic framework in mind, amidst a steady stream of other new client work, summer fun, vacations and a whole host of general life commitments, we steadily worked on the project. Google hangouts, Slack, email and the telephone were how we collaborated. 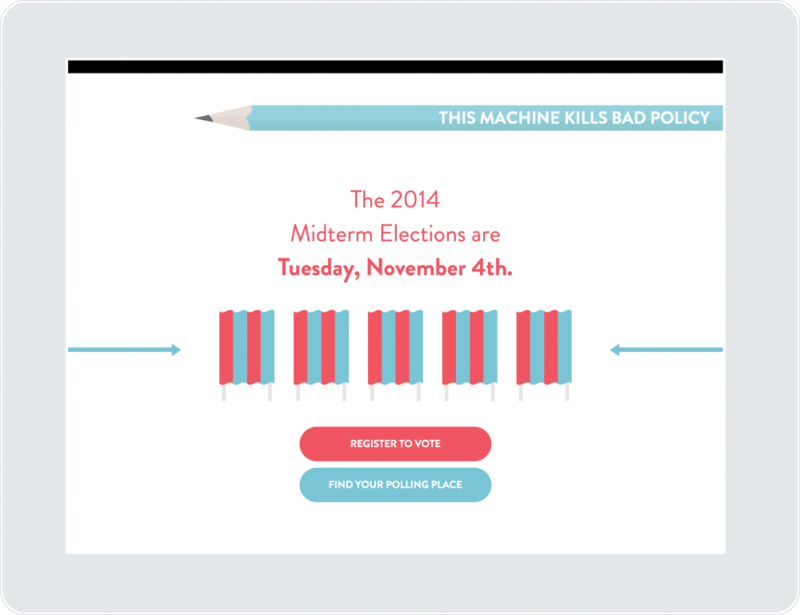 “I Voted Today” formally launched three weeks before the 2014 midterm elections and can now be shared far and wide. We loved this process. Challenging to be sure, but working with other people who can really deliver is a truly wonderful experience. Independent experts just doing what they do with great care and attention to detail. Philosophically, with our design and development work, we want to move forward issues and causes important to the world changes out there. We want to create small, design-centric projects that are engaging and concise. No bloated features that are hardly ever used. No forced conformity. No huge amounts of text, text and more text. No “old Internet” distraction, clutter or unrelated sliding messages. We believe in focused design, beautiful content, fast performance and connected experiences meant to build momentum. 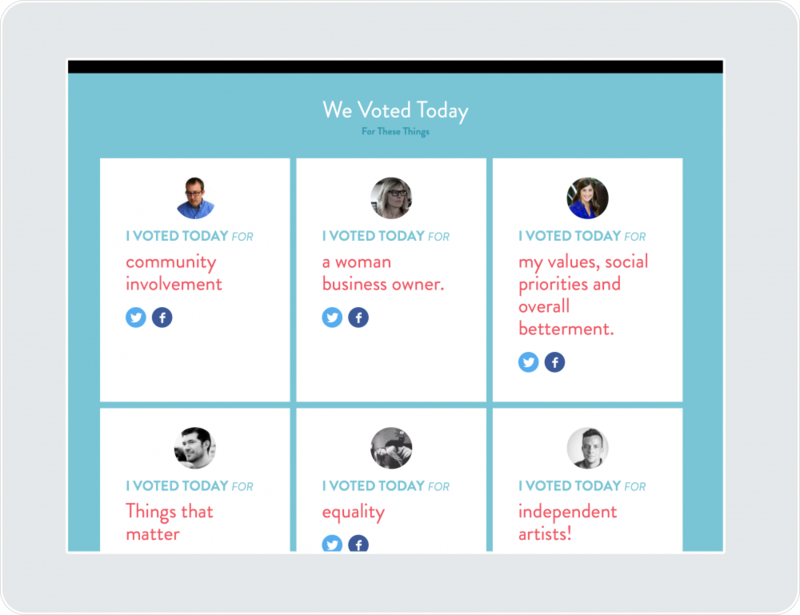 This was the driving force behind the creation of “I Voted Today.” After launch, we can confidently say this project represents those views. Now let’s break things down. Yard signs for a neighborhood near you. Making your voice heard by casting ballots in local and national elections is at the core of our democracy. So why wrap that together with this notion of every day voting with our own individual choices? To build a culture of participation, we want to rally the participants. People make choices every day that are small political acts — what you eat, how you get around, what you support with your money and how you engage online. 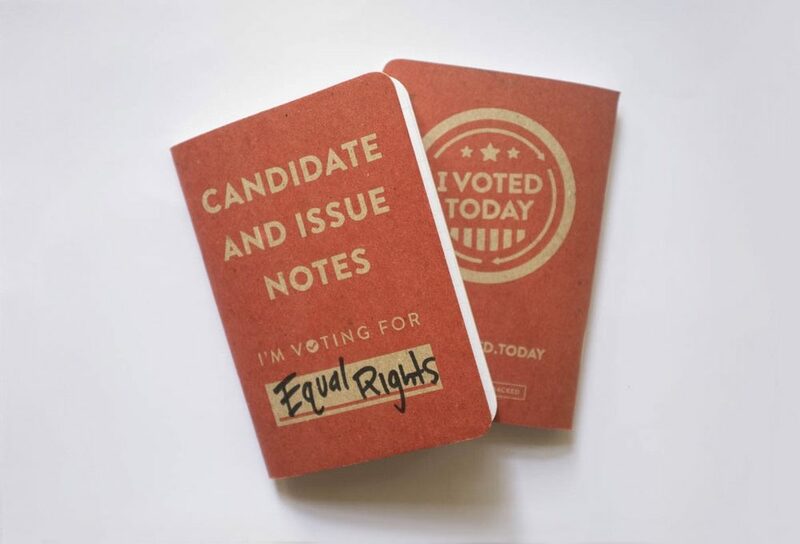 We not only vote for candidates based on how they see issues like health care and marriage equality, but we are consistently involved with those issues in between elections. Whether we’re calling our congressman, writing letters to the paper or debating with our friends and family. Let’s empower people to be proud of the votes taken day in, day out. A modern take on an American democracy classic that holds true to past patriotic aesthetics when it comes to getting out the vote. But with more flair. 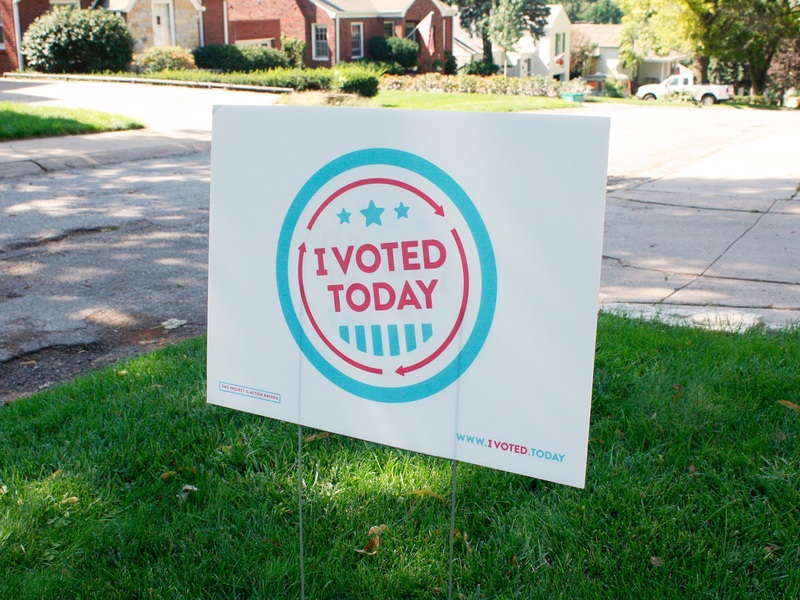 And conceptually, it aligns with our goal of getting people excited about voting in some way, every day. (Note the round-and-round arrows.) Energetic, bright, hopeful, optimistic. No lecturing, not stuffy. The secondary elements for the campaign are simple. 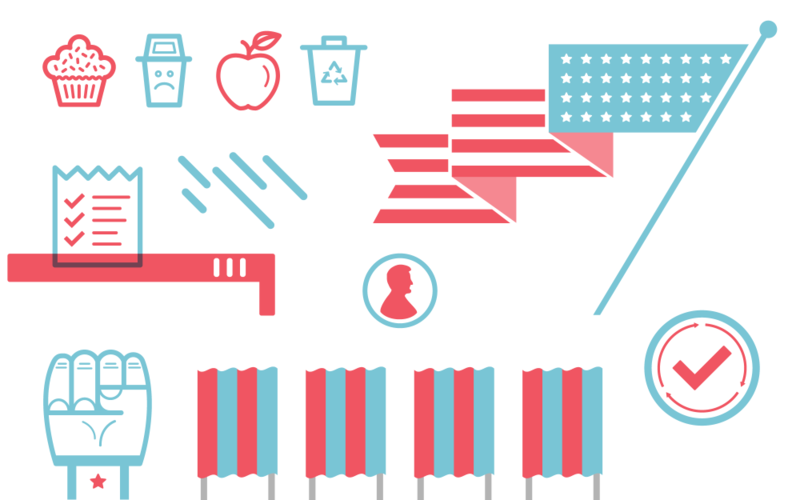 Flags, voting booths and fists mixed with trash cans, receipts and cupcakes to create an array of visuals to support the main button design. When it comes to the colors, we’re still red, white and blue, just not so red, white and blue. These colors together dance in the spectrum of American politics but have a little more of an independent attitude. Coming in at 01:12, this piece of animated work is probably our favorite component of the project. Animation is tough to be sure. There’s an immense amount of thought, planning and execution, hence the price tag that comes with it. But it can be such a key way to tell the story of any cause, campaign or organization. When you’re willing to invest in this sort of original content, it takes a project to a whole new level of engagement with exciting opportunities to reach more people. 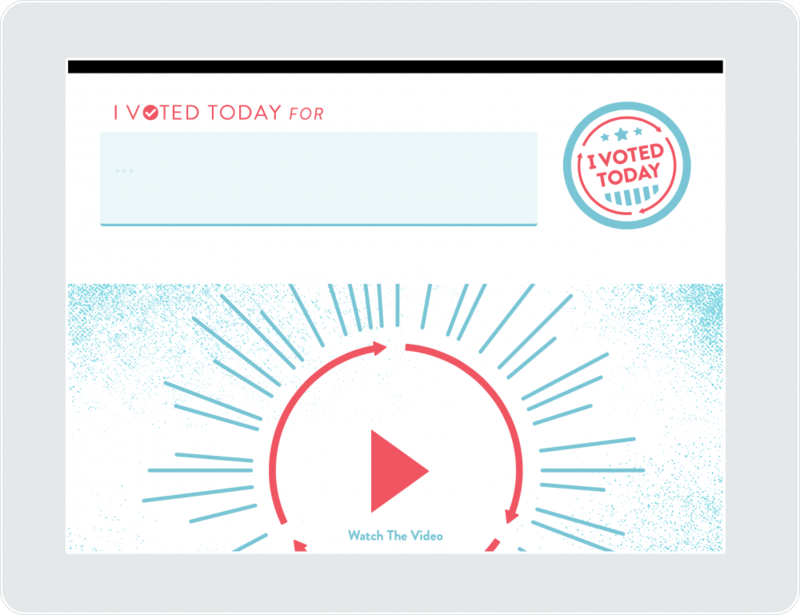 A small, design-centric website focuses on telling the “I Voted Today” story in an engaging and concise manner. A responsive site launched to the highest standards of the modern Web. Home to the animation and campaign graphics clearly presented and ready to share. We also use the site as a way to reinforce the idea of voting every day. We took the time to build a unique experience for visitors to enter in what they voted for today. That content becomes part of the site to help tell the story of the project. Ellen voted today for equality. Joe voted today for things that matter. Chris voted today for community involvement. In their own, unique ways, people participate every day in American life that enhance the quality of our democratic experience. The site is also sprinkled with supporting assets like buttons, pencils and yard signs that leads into the final part of the project. A super simple Rails app to power the functionality. We like merch. It might have to do with our punk rock roots. Buttons, stickers, T-shirts. Having a physical set of goods is a simple way for an idea to have more staying power. Sell, send, hand out, drop off, etc. Just get the goods out there. From online pixels to offline physicality. We sent out packages to some select people and organizations to “self-promote.” If you were on that list of folks, we hope you like the goodies. 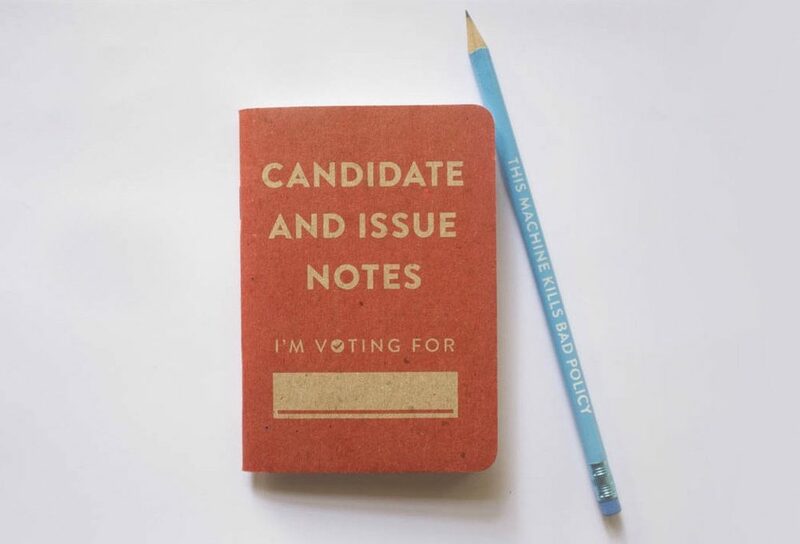 This includes some Scout Books and #2 pencils for you to take with you when you go to the polls on election day. Democracy packs for voting enthusiasts. We’re calling the project now complete. It has all the components we think are needed to move a cause out to the masses. A unique, compelling brand with the right amount of thought that’s executed with the right amount of care and craft. A modern, impeccably built Web presence. The experience honed and streamlined to make for easy comprehension and delightful engagement on whatever device you’re scrolling on. And there’s the storytelling element, in this case, a stellar animation. It’s where the magic happens. A wonderful story about participating in our democratic process and voting on the little and big things every day. Especially on election day. That’s the “I Voted Today” project. In the process we worked through the gauntlet where possibility and dread often engage in a tug-o-war style cage match. We can definitely say we’re not famous, we don’t think we’re hated and we have plenty of fine folks we’re currently working on projects for. A standard outcome for any creative endeavor. We’ve told you pretty much everything. Now we’re on to the next. We will, of course, continue to “vote with our time” when it comes to the people we partner with and the projects we take on. If you’re interested, follow along on Twitter. And don’t forget, it’s just about time to be heading to the polls.